This week my youngest returned from camp. He is the kind of kid who talks A LOT (to put it lightly) and I found our house to be way too quiet with him gone. I'd liked to say that I got a lot done while he was away and while I did walk the beach one morning with a girlfriend, other than that I found myself just wandering aimlessly around. Oh...and I made a lot of lists of things I was hoping to accomplish at some point in the future, like paint the baseboards and get rid of all the wire hangers. But he's home now and all is more balanced in my little world. 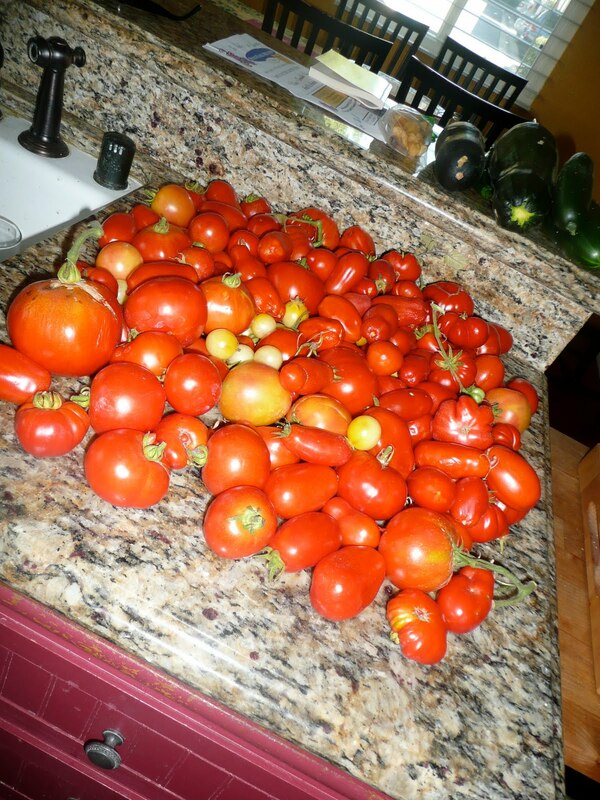 I'm thinking I've picked close to 75lbs so far and I have a freezer full of homemade marinara to show for it. Not bad for the chilly summer we've been having. Warm weather, where art thou? Today we are hanging with my in-laws and tending to the yard and catching up on laundry and texting our oldest (who is in Florida today...Alabama tomorrow) and paying some bills (cable and electric, in case you were wondering) and cleaning out the car and eating lemon cookies. So glad your son is back!! :) Makes one happy mama!! Love reading your blog. Following you from Friendly Friday! !